Do you take your kids to the park? Sign them up for soccer or softball? Parents who care about their children’s health likely encourage outdoor play and participation in organized sports. In the spring, as we begin to shop for soccer cleats and baseball mitts; it is wise to investigate how your schools and municipalities manage their green spaces. Pesticide exposure is a serious health risk to children. And while limiting, or better yet, eliminating ingested pesticides is important, consider the direct exposure your children may get while they play upon that green, green grass. Not only have the multitude of herbicides, fungicides and pest control agents been implicated in a number of cancers, but such agents are now being exposed as “hormone/endocrine disrupters.” This one possible contributer to the declining age of the onset of puberty among girls. Commonly used pesticides like Round Up and Trimec can, along with other factors cause and trigger asthma. Do you know what your school and town use on playing fields and other recreational areas? If not, ASK! What is the application schedule? How can you be notified about any chemical applications? Even when your home is green on the inside, pesticides can be tracked in on those soccer cleats, clothing and even your pet’s paws. Beyond Pesticides has a great round-up (no put intended) of information. 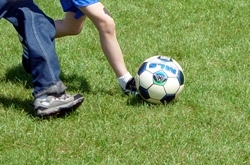 Many municipalities have banned the use of pesticides on playing fields. Championing pesticide-free parks can be a wonderful cornerstone to raise awareness community-wide and discourage the use of pesticide in and around homes. We all live downwind and downstream after all! Learn about the most common chemicals used. Oh great. I hadn’t thought of that.